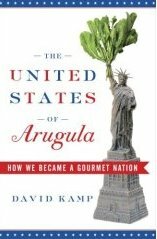 A definite must-have as well as a "must-give" this holiday season is David Kamp's latest book The United States of Arugula: How We Became a Gourmet Nation. In it, the Vanity Fair editor and GQ writer tells how America went from being a nation of icebox lettuce eaters to a nation of Rocket and Swiss Chard connoisseurs. And along with this came a host of temperamental French chefs into the mix, a greater love for standard reference books like Larousse Gastronomique -- and allowing a tall, surprisingly affable woman named Julia Child into our homes on a daily basis. In this story of America's gourmet revolution, Kamp focuses on the real-life characters behind the big culinary names, thanks to numerous interviews and a few newly reported facts. A book that's not only just for foodies, The United States of Arugula satisfies an appetite -- you probably didn't even know you had. Trust me, if you're in doubt about what to give this Christmas and you happen to be thinking "books," then do think about this one. Coming in as a close second to the fast-paced, fast eating indigestion and agida of the Annual Nathan's Famous Fourth Of July International Hot Dog Eating Contest at Coney Island, Brooklyn each year, is the Axia 3 Thanksgiving Invitational held further uptown last week at Artie's Delicatessen here in Manhattan. The top prize went to Pat Bertoletti of Chicago, who scoffed down 4.8 pounds of turkey in twelve minutes, but Manhattan's own Tim "Eater X" Janus came in second, with famed downtown roué Jason "Crazy Legs" Conti coming in fourth. Arturo Rios of New Jersey took third. Needless to say, the results were encouraging for all fans of New York's competitive eaters -- antacids, not included. Be sure to burp first, then read more about it here at NY Metro's Grub Street. The entire meal, that is. And I'm talking about drinking your meal in one of several Jones Soda holiday flavors. (And just in case you were wondering, the holiday gravy is included.) Yum... I think. 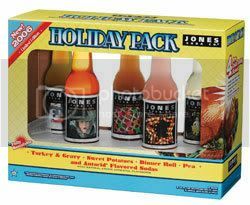 In business since 1987 and known for their quirkiness when it comes to soda flavors, for the holiday season The Jones Soda Co. offers flavors such as: Turkey and Gravy soda, Sweet Potato Soda, Dinner Roll Soda, Green Pea Soda, and of course -- Antacid Flavored Soda. Also included: A medicinal cup for accurate servings. And for dessert: Cherry Pie, Banana Cream Pie, Key Lime Pie, Apple Pie, Blueberry Pie. All sodas are said to be completely vegetarian, certified kosher, and contain zero caffeine, calories, and carbs. So looking for something a little more than your usual ho-hum holiday meal? Well, here's your chance at something a bit different -- with absolutely zero dishes to wash up afterward. By the way, Turkey & Gravy doesn't interest you? Feel free to say so by visiting their suggest a flavor page, and tell them what flavors you'd like to see. Seriously, with the links above to support it...you can't make this stuff up, guys. 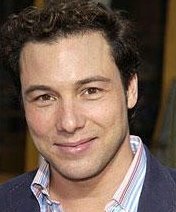 In keeping with the story that broke earlier this year, it looks like Rocco DiSpirito's reality TV show for A&E , where the noted chef and cookbook author goes into to the average kitchen and helps out with a major cooking catastrophe -- or special event, will be a reality after all. Sort of a cross between a Food 911 and The Discovery Channel's Take Home Chef, the pilot episode for this new show has now been shot and completed, according to sources working close to its production. The subject of Rocco’s culinary makeover is a woman who owns a speed dating service, but ironically chooses to remain very much single herself. Sources say A&E loves the pilot and is expected to pick up the series as soon as they can figure out the time slot. This also marks Rocco's return to the small screen since NBC's ill-fated The Restaurant . So, lots of luck this time around, Rocco, and I'm sure many of us will... stay tuned. So popular was the 1990s Japanese Fuji TV phenomenon that a book was made about it, and is still being sold today as a reprint done by Food Network and Berkley Publishing here in the U.S. And could we ever really forget the original flamboyance of the sequin-jacketed Chairman Takeshi Kaga, or the masterful Kitchen Stadium skills of resident chefs Hiroyuki Sakai, Chen Kenichi, Masahuru Morimoto, Masahiko Kobe, et al? 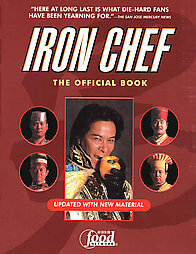 The remake of this landmark cooking showcase titled, Iron Chef America, is now just a few years into the annals of TV history here in the U.S., with the comparable mastery of chefs Bobby Flay, Mario Batali, Masahuru Morimoto (the lone holdover from the original version), and female super chef Cat Cora. The old Kitchen Stadium setting has been recreated with a more 21st century facelift, and Chairman Kaga has been replaced by actor and martial artist Mark Dacascos, who, if I remember correctly, once mentioned something about being Chairman Kaga's...nephew? In a special Iron Chef America presentation, Food Network All Stars Rachael Ray and Giada De Laurentiis come to Kitchen Stadium to battle it out. In a special twist, the Chairman decides to pair them with Iron Chefs Bobby Flay and Mario Batali in an unexpected battle. Needless to say, this one oughtta be quite interesting, as Giada, the granddaughter of legendary film producer Dino De Laurentiis and the E.V.O.O. girl and talk show host herself, Rachael Ray, duke it out (as well as show us exactly what they've got -- under pressure) with chefs Flay and Batali. So check your local TV listings on Sunday, and tune in to watch what happens. 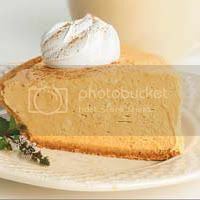 Combine cream cheese, pumpkin, sugar, vanilla, and spices; mix with a hand mixer at medium speed until well blended. Add eggs; mix until blended. Pour into graham cracker crust. Bake at 350° F.
A dollup of your favorite whipped topping (Cool Whip, et al) goes a long way in making this delicious dessert a true holiday classic. Over the past seven years, Bednar, executive chef of the H20 Restaurant and Lounge, has been a SOS Share Our Strength leader by teaching 17 Operation Frontline classes to children, young adults, and people living with HIV/AIDS. His students have learned how to read nutritional labels, budget their money while grocery shopping, and make healthier food choices. Making an *all-round* difference in the day-to-day lives they lead. Kudos and thanks, Chef Bednar. I'd like to give a big shout out to this historical hotel here in NYC, and their seemingly uncanny knack for making the BEST Chocolate Martini this world has ever seen! I was there last night at a kick-off celebration for the Backspace All-Agent Conference and needless to say, a good time was had by all. It was also great seeing my good pal and prolific writer Devon Ellington who also stopped by. No doubt, Dorothy Parker and all the other Round Table inhabitants would have been proud, I'm sure. Urban chic and totally unique as the featured chef at the 2006 Megafest Christian Conference and host of TV One's Turn Up The Heat , Gerry "G" Garvin combines his impressive culinary resume and funky, down-to-earth style to offer simple techniques for savory recipes along with laugh-out-loud anecdotes and overall cooking know-how. Clearly, I can't get enough of watching his easy to follow instructions for some of the most scrumptious stuff you could ever imagine. 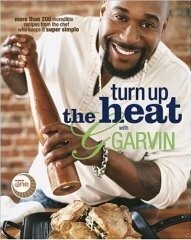 And, as of just last month, many of these recipes are now in his first cookbook offering titled Turn Up The Heat . Trust me, nobody does for chicken…what G. Garvin does.